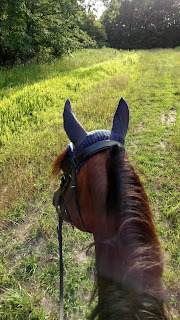 After working pretty hard in our lesson Tuesday (well, for us anyway), Wednesday I just took Ruby out on a nice hack. I believe I mentioned in my post about ACS that it has extensive trails -- it’s one of my favorite parts about the barn. 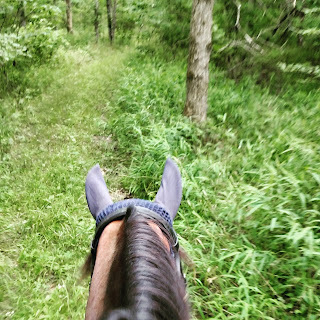 There are hills, fields, woods, creeks to cross: pretty much some of everything! 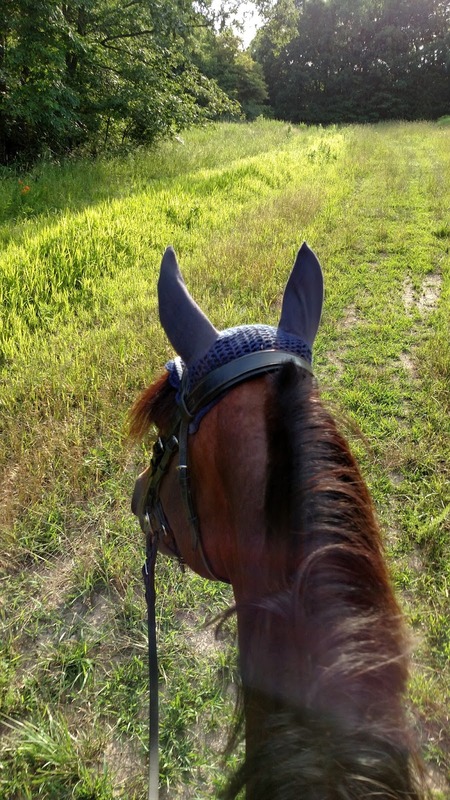 While I enjoy lessons and accomplishing things in the arena, I’m much happier outside of it. 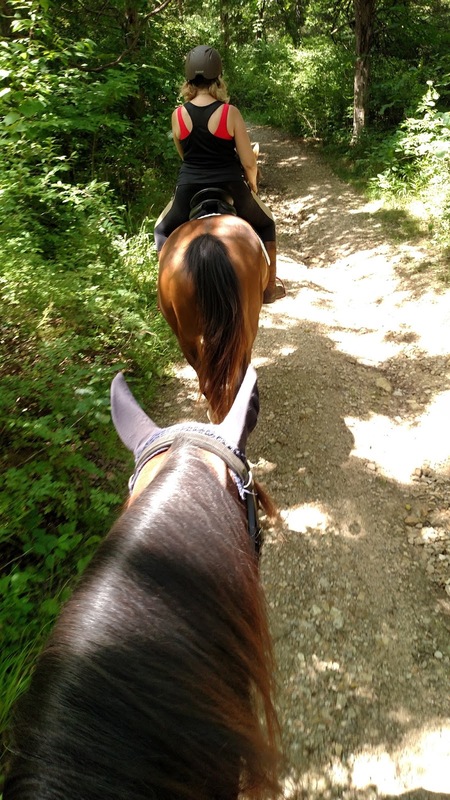 There is nothing like a brisk canter through the fields, having to detour around a turtle in the creek, or hacking on the buckle through quiet, shady woods. In the summer the insects can get a little intense, but for the most part, I try to incorporate hacking out into my riding schedule year-round. 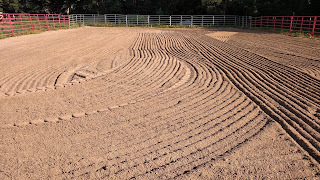 In the winter the shorter daylight hours usually limits me to weekends (and the weather plays a role), but once the days start getting longer, I probably spend 50-75% of my time outside of the arena. We hacked for about half an hour on Wednesday -- I typically track my solo rides using the app Track my Hack, which gives me information like distance, average speed, and a GPS map of where I rode. However, when I tried to save and download the hack afterwards, the app bugged out, so I’m not sure what’s going on with it. Hanna tells me that I can use my FitBit for basically the same function, so I’ll probably be experimenting with that over the weekend. 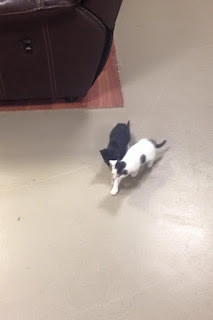 And now for my experience in cat whispering last night (haha). 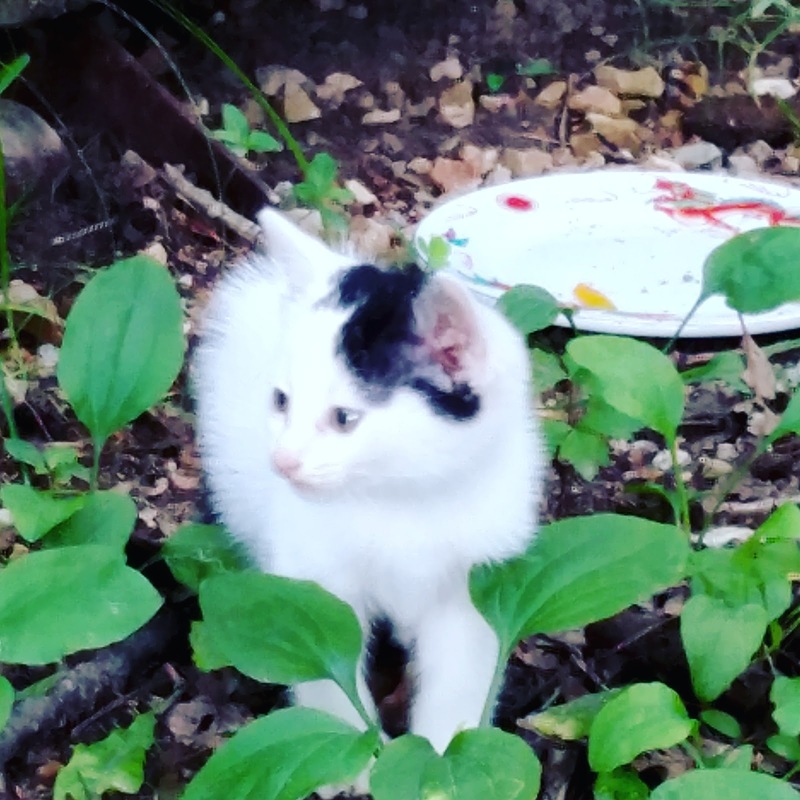 Yesterday morning the barn owner mentioned to me that a tiny black and white kitten had shown up at the barn and was making it’s presence known by crying at the top of it’s lungs, but that she hadn’t been able to catch it. I went out to the barn last night with the intention of lunging Ruby, but I got distracted by the squalling kitten. A few other people had tried unsuccessfully to catch it, but I gave it a shot. 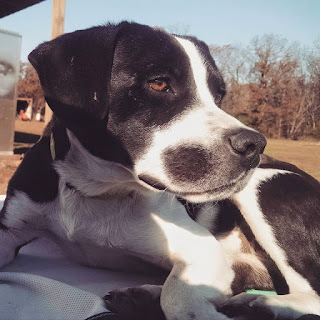 I guess I should preface this story with the fact that I’m kind of a magnet for animals -- not only do all the stray animals somehow find their way to our farm, but even pets that don’t like strangers/don’t like people/are antisocial always seem to love me. It’s a gift. I’ve caught more half-feral cats than I care to count with just some patience and my presence. So despite the fact that this little black and white kitten spent the day running away from people, it only took me about 5 minutes to catch it and convince it that head scratches were the best thing ever. Then it started following me all over the farm, which seriously put a crimp in my plans to work Ruby, since little kitty had no sense of self-preservation and kept darting under feet/into stalls. Stink Dog - a rescue/rehab/rehoming project from last fall. I finally just decided that Ruby could have the day off and took the little tyke home (in a shoebox I happened to have in the car, which s/he protested vigorously). I locked it in my feed room with some food and started reaching out to friends trying to find it a home. We already have three barn cats, and they’re fairly clique-ish (we had a fourth for a while but she disappeared last month, so sad), so while I could keep the little guy, I didn’t necessarily want to if I could find him a better home. Luckily a friend of mine was looking for a kitten to bring home as a companion for her other cat, so she stopped by and picked up the little black and white munchkin (saving me from having to explain to DH how we ended up with another mouth to feed). Settling in to the new home! 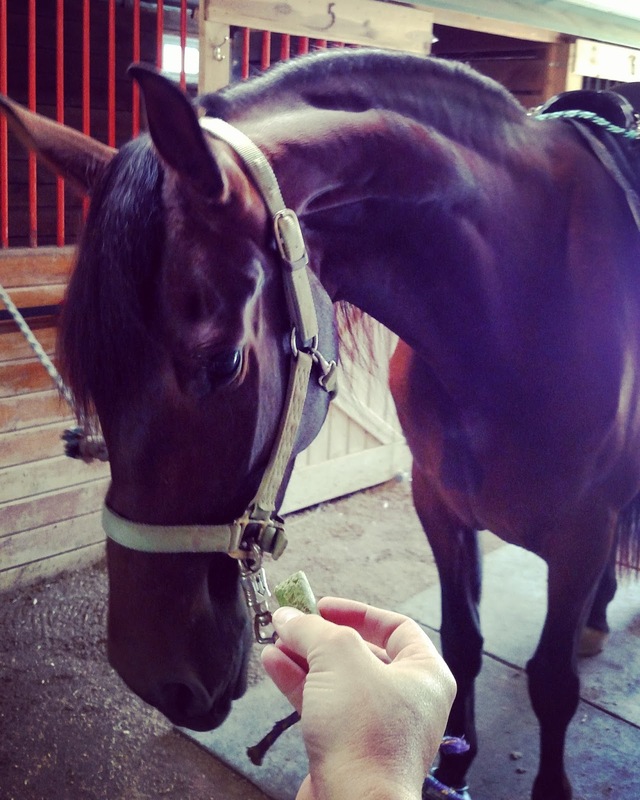 Today after work I squeezed in a quick nap after work (didn't sleep last night, which you probably know if you follow me on Instagram, haha), and then headed out to the barn to meet another boarder. We had a quick schooling session in the arena, and then headed out for a mini trail ride! 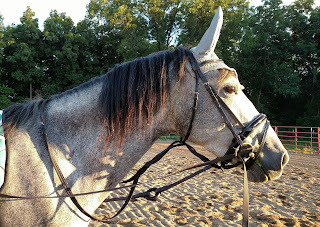 She is one of the more recent boarders at the barn, and she hasn't had much of a chance to ride on the trails yet, so Ruby and I were happy to take her out and show her the ropes! "I can haz cookie plz?" I also managed to squeeze in a quick workout for the baby horse tonight. I really, really wanted to ride her, but I didn't have anyone to serve as my eyes on the ground (aka 911 dialer if things go south!). 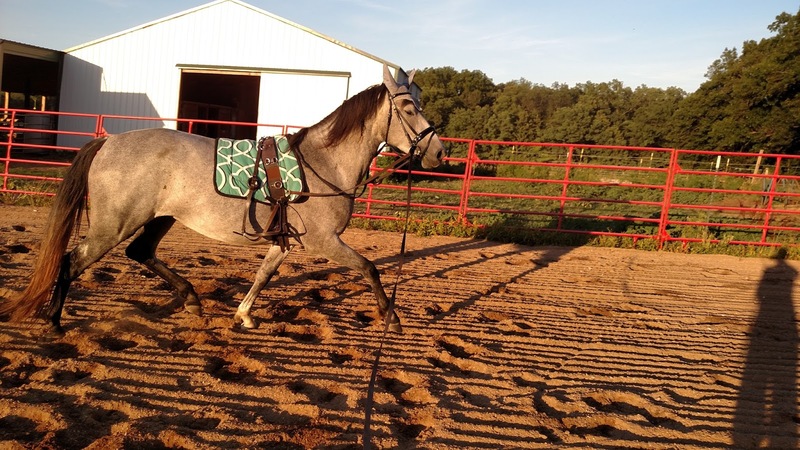 That's probably for the best, as she had a bit of a case of the baby dumbs and had to work quite hard before things clicked, but we ended on a good note and then we hand grazed -- which actually mostly consisted of her breathing down my neck and generally being a pest... haha. Who can resist a freshly dragged arena? Thanks DH! Growing into Topaz's hand-me-downs (the fly bonnet, she'll never grow into the bridles haha). Unrelenting rain is in the forecast for this weekend, but luckily I have some fun other blogs drafted for next week! (since its unlikely I'll be doing a lot of riding in the near future). aw that kitten is adorable haha. 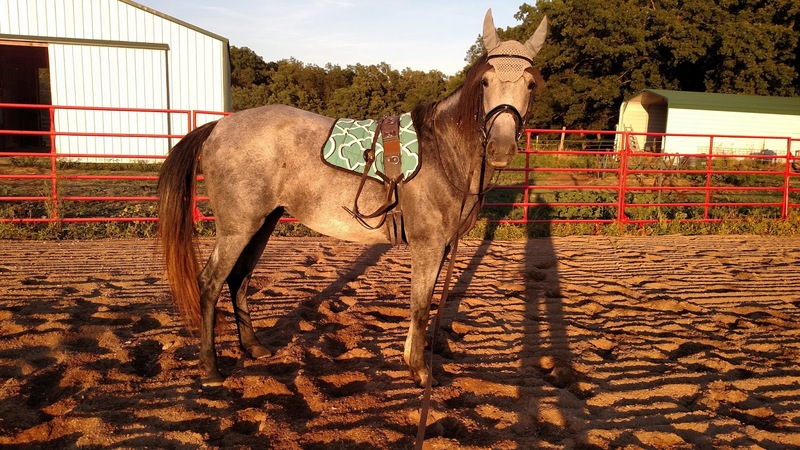 sounds like a great week of riding and getting out and about with the ponies! The kitten was so sweet and snuggly! Her new mom has been posting photos and it looks like she is quite happy!